Better waste management saves energy. Waste reduction, reuse and recycling save the most energy by capturing the energy “embedded” in the manufacturing of a product or raw material. 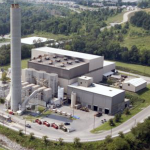 EfW facilities also recover significant amounts of energy from the remaining municipal solid waste (MSW), generating clean, renewable electricity and/or steam for export. 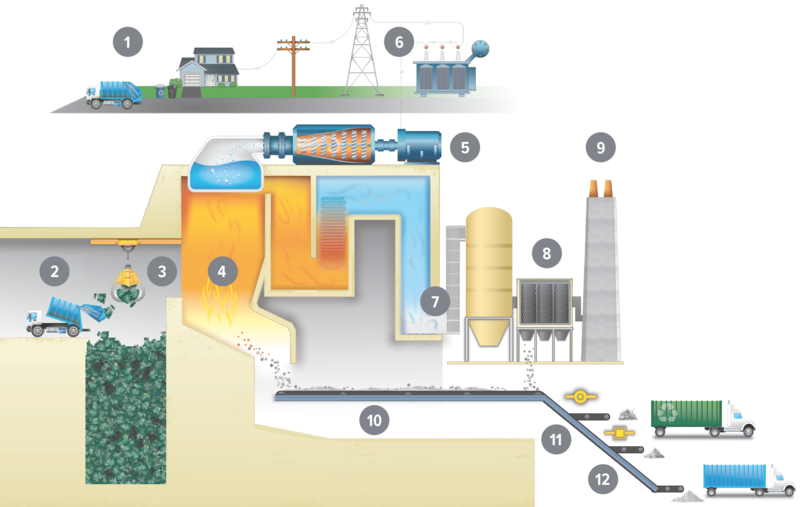 Compared to landfills equipped with gas-to-energy recovery systems, EfW facilities are 9 to 14 times as effective at capturing the energy that remains in MSW after recycling. 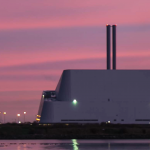 EfW facilities are baseload, meaning that they generate their electricity consistently. As a result, they serve as an excellent complement to intermittent renewable resources, like wind and solar. 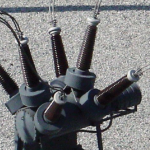 EfW facilities are also often built near load centers, which reduces the energy losses associated with long-distance transmission of electricity. Post-recycled MSW is picked up at your home or business. Waste is delivered to the tipping floor and temporarily stored in a bunker. All of the air used in the combustion process is drawn from the tipping and bunker areas of our facilities to control odor. The waste is fed into a combustion chamber and burned at extremely high temperatures in a self-sustaining process. Auxiliary fuels like natural gas and fuel oil are not needed to maintain combustion. Heat from combustion boils water to create steam. The steam turns a turbine-driven generator to produce electricity or may be used directly for heating or industrial processes. Electricity is distributed to the grid and used to power homes and businesses. State-of-the-art air pollution control equipment is used to cool, collect and clean combustion gases. This equipment operates under stringent state and federal standards. We control emissions of particulate matter primarily through a baghouse (fabric filter). Emissions and other operating criteria are continuously monitored to ensure compliance with state and federal standards. Residual material from the combustion process is collected for processing and metals extraction. Ferrous and non-ferrous metals are extracted for recycling. Remaining residual materials are beneficially reused or disposed of in a landfill. 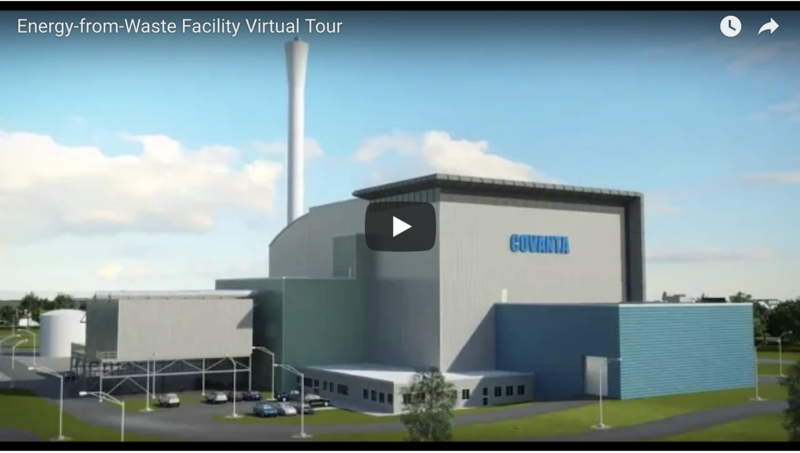 In May 2016, Covanta announced a partnership with Veolia UK, a waste, water and energy services company, to develop the Rookery South Energy Recovery Facility in Bedfordshire, United Kingdom. Construction is expected to begin by late 2017 with the facility becoming operational in 2020. 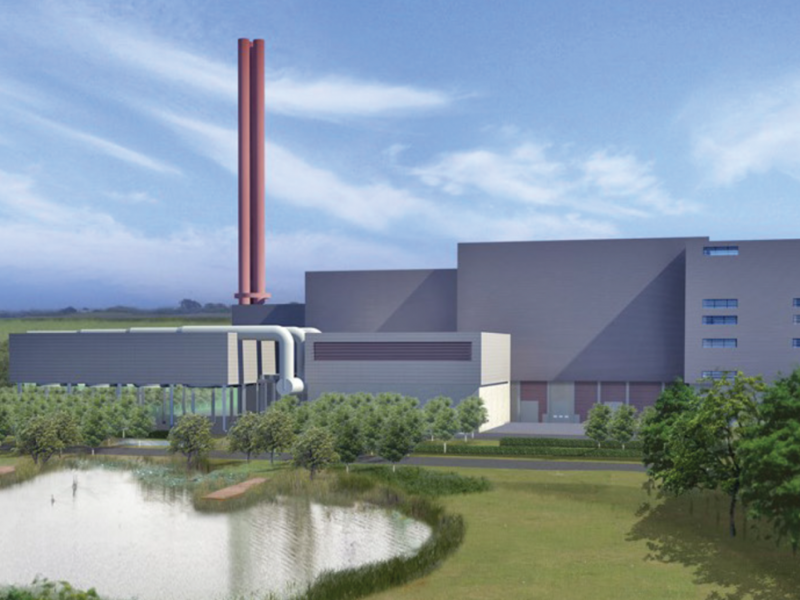 The two companies will jointly own the project, with Veolia providing the waste and Covanta operating the facility. For more information, access the project’s website here. From pesticides to pharmaceuticals, some waste is difficult, if not impossible, to dispose of using traditional means. For example, when medications are improperly flushed down the drain or discarded in landfills, they can enter waterways and contaminate surface waters. Even with traditional wastewater treatment, these substances can adversely affect drinking water and the environment. Our EfW facilities provide safe, environmentally sound destruction of waste that protects water resources while creating renewable energy. 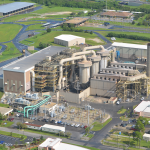 The U.S. Environmental Protection Agency (U.S. EPA) considers the disposal of pharmaceuticals in an EfW facility to be “environmentally protective.” Since the launch of our Prescription for Safety (Rx4Safety) program in 2010, Covanta facilities have destroyed over 4 million pounds of unwanted drugs and medications. Our EfW facilities also provide a responsible method for disposing of other persistent organic pollutants, such as perfluorinated compounds (PFCs) and nonhazardous pesticides and herbicides because these facilities combust wastes at temperatures of more than 2,000°F. In accordance with federal regulations and our permits, we continuously monitor carbon monoxide levels to ensure complete combustion and must demonstrate meeting temperature requirements. If Americans followed the waste hierarchy, we could save energy equivalent to all of the nation’s wind and solar electricity production combined.